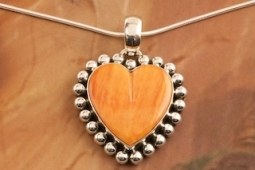 Genuine Spiny Oyster Shell set in Sterling Silver Heart Pendant. Created by Navajo Artist Artie Yellowhorse. Signed by the artist. Free 18" Sterling Silver Chain with purchase of pendant.